I have recently been attending meetings with Cornerstone Housing Society - an organization that was established here in St. John's in 2012, and is dedicated to the creation of homes for adults with intellectual disabilities in Newfoundland and Labrador. "It is our goal and intent to become a L’Arche community where adults with intellectual disabilities and their assistants live together, where mutual dependence is fostered, where spiritual and social well-being is promoted and supported. Our focus as Cornerstone Housing Society is to acquire property and build a house that will become a home for the adults with intellectual disabilities who choose to live there." As a parent of a child with a disability, it can be frightening to think about the future, and what might happen when I'm gone. Who will care for my son when I am not able to? It is perhaps one of the hardest and scariest things to think about. I remember being at an event where Randy Lewis spoke, and one thing that stuck with me was when he said that "Like most parents with a child with a disability, we share the same wish: to live just one day longer than our child." His bold statement hit me right in the heart, and I think about it often. What will happen to my son if he outlives me? Who is going to care for him? Can I ever earn enough and save enough to provide my child with a fulfilling life after I'm gone? Right now, Brennen is just eleven years old. I have grown into my role as a parent of a child with special needs. 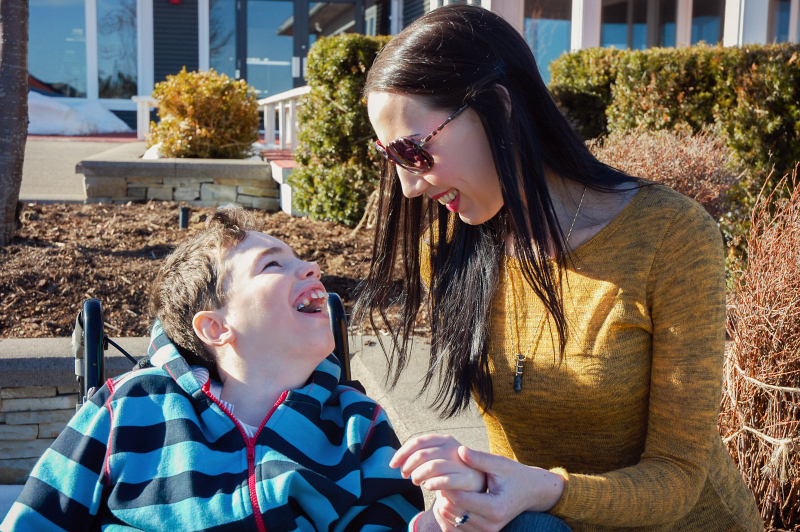 I am confident that I know what is best for him and that I am doing everything I can to create a beautiful life for him, and for our famiily, but the reality is that children with disabilities become adults with disabilities. It can be daunting to think about what the future holds for us, but I am encouraged to know that other parents are concerned about many of the same things, and are taking steps to create an option for long-term care for people with developmental disabilities. L'Arche is a unique version of caregiving and community-building that fosters inclusion, understanding and belonging. L'Arche was created in 1964 when Canadian Jean Vanier welcomed two men with intellectual disabilities into his small home in France. Appalled by the conditions in institutions for people with disabilities, he founded what has become the international movement of L'Arche communities. L'Arche grew quickly and spread around the world. Today there are over 140 L'Arche communities in 40 countries. There are 29 L'Arche communities with almost 200 homes across Canada. L'Arche believes that home should be a place of friendship where each person contributes. It believes in providing people with developmental disabilities with meaningful work, or if they are not able to work, ensuring that they have enriching daytime activities integrated as much as possible into the wider community. L'Arche believes that individuals with disabilities enjoy doing many of the same things that others in society enjoy and that, with assistance and accompaniment, participation is almost always possible. Please watch this beautiful film that takes us inside a community home in Ottawa, Ontario that is part of the L'Arche organization. Para Normal is an award-winning short film in which filmmaker Rostyslav Makushak introduces us to three adults with developmental disabilities, telling a story of their learning experience as they share their lives in a group home. The film is poignant and very moving. While the unique living circumstances of these individuals are evident, it is the joy, happiness and contentment that stands out above anything else. The 'core members' (as the people with disabilities are called), are at the heart of the home, but it is not only the core members who benefit from this type of living arrangement. Every year, L'Arche has a transformative impact on the lives of hundreds of young people who assist in L'Arche settings. Your soul cannot help but grow in a community like this. I know from experience that working with and living with individuals with disabilities, you discover what is profoundly universally human in all of us. Life in a L'Arche community may not suit everybody, but there are things about it that we can learn from and transfer to other settings, like the goodness and mutual enrichment that grows from relationships, and the spirit and attitudes that make life-shaping encounters possible. Jean Vanier created L'Arche to nurture a different kind of life - one focused on connection, where the gifts and contributions of every person are valued, and where everyone can belong. When I think about what I want for my son when I am no longer here, or am no longer able to care for him, it is exactly this. I think about a safe, nurturing environment where he has friends, where he is accepted and loved and cared for in a way that we all want our children to be cared for - with dignity and respect, kindness and compassion. You need to be ready to think about things like this. It's not an easy subject. I was contacted initially about a year and a half ago, by one of the founding members of Cornerstone Housing Society, and I was just not ready to talk about it, but it came to my attention again recently, and I am giving it some serious thought. I guess it's just that right now, today, I feel strong and capable as Brennen's mom. I know that right now I don't have to dwell on ten years, twenty years, thirty years down the road, but eventually I have to think ahead because his future depends on it. The good thing is that every day as Brennen's mom makes me ready for the next day, and it feels good to know that I am making connections and doing my part to make this world a kinder place for him to grow and thrive. Thanks for your insightful article Julie, we enjoyed reading it and inspired by your example of your families' life! Thank you for bringing attention to this important living arrangement. Thanks, too, for adding this link to DifferentDream.com's Tuesday link up.